A view from the International bridge between Presidio, Texas, and Ojinaga, Mexico, shows the flooded checkpoint between the two cities on Sept. 17, 2008. A levee broke and water from the Rio Grande inundated parts of the city with 10 feet of water. 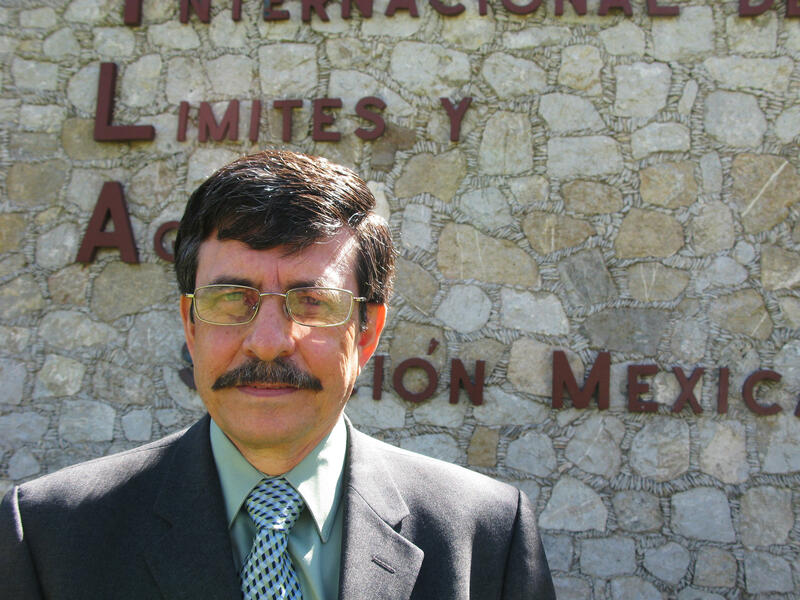 Antonio Rascón, chief engineer of the Mexican section of the International Boundary and Water Commission, says the U.S. has already built nearly 700 miles of security fence and Mexico has consistently opposed it. Blocked by the pedestrian fence, floodwaters from Headquarters Wash near Lukeville, Ariz., flowed along the fence and into the Mexican Port of Entry in Sonoyta, Sonora, in 2008. Alberto Perez, Rio Grande City manager (left), and Gilbert Millan, the city's planning director, walk along the riverbank to show how close the earlier planned fence would be located next to the water. Read a version of this story in Spanish. As the White House pushes Congress to fund President Trump's U.S.-Mexico border wall, a new wrinkle has emerged that could stymie parts of the massive project. Mexican engineers believe construction of the border barrier may violate a 47-year-old treaty governing the shared waters of the Rio Grande. If Mexico protests, the fate of the wall could end up in an international court. Antonio Rascón, chief Mexican engineer on the International Boundary and Water Commission, said in an interview with NPR that some border wall proposals he has seen would violate the treaty, and that Mexico would not stand for that. "A concrete wall that blocks trans-border water movement is a total obstruction. If they plan that type of project, we will oppose it," he said in his first public comments on the border wall. The U.S. Department of Homeland Security has not finalized what the new wall would look like, or precisely where it would go. But some of the initial schematics show it could be as high as 30 feet and made of solid concrete. Mexico is watching with growing alarm as Homeland Security moves ahead with its plan to dramatically extend a border barrier that already has caused serious flooding. While Congress debates whether to include funding in a stopgap spending plan, the department has solicited bids for prototypes. Trump also said he would continue to ask Mexico to pay for the wall, but Mexican President Enrique Peña Nieto has said repeatedly that he has no plans to foot the bill. The 1970 Boundary Treaty lays out the precise border between the U.S. and Mexico and sets rules for the riverside regions. The treaty states both U.S. and Mexican officials on the International Boundary and Water Commission, or IBWC, must agree if one side wants to build any structure that would affect the flow of the Rio Grande or its floodwaters. The U.S. already has built nearly 700 miles of security fence, and Mexico has consistently opposed it. 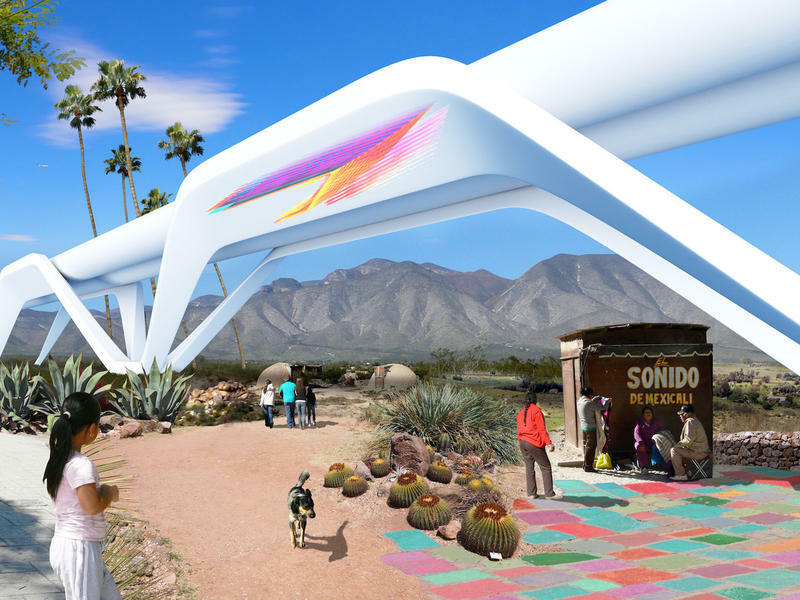 After Mexico protested the earlier fence construction, the U.S. made some design modifications, but the project went ahead over Mexico's objections. "For us, we are not in agreement with construction of a wall in the floodplain that affects the trans-border flow of water," Rascón said. "In general, we have been complaining about the fence since 1992. We're talking 25 years. That's when they installed the first fence in San Diego, and it's been advancing and advancing." The International Boundary and Water Commission, located in Juarez, Mexico, and El Paso, Texas, has tried to resolve differences quietly with professionalism and diplomacy in its 128 years of existence. But the bold plan for Trump's wall is straining that cross-border collegiality. Stephen Mumme, a political science professor at Colorado State University who has studied U.S.-Mexico water diplomacy for nearly 40 years, predicts a showdown is coming. "This is supposed to go forward on a binational, cooperative basis, and that is not happening," Mumme said. "Mexico asserting a treaty right under the 1970 Boundary Treaty is more likely than ever because of the heightened nationalism and the indignation about the United States fence/wall project." To protest the border wall, Mexican officials on the Boundary and Water Commission would first lodge a formal complaint with their counterpart across the river in El Paso. If they don't resolve the dispute, the matter goes to the State Department and its Mexican equivalent, and finally, to arbitration before a world court. Mumme says concerns over floods on the border are well-founded. He and other river hydraulics experts point out that a wall built in a floodplain acts like a dam. During torrential rains, these obstructions deflect water and worsen flooding. "It can occur, and probably will occur, if you create, in effect, a series of little dams along one side of the river," Mumme said. "We have a history. We know they occur." Over the past nine years, steel fencing has clogged with debris along the Arizona border during the summer rainy season. Floodwaters damaged Organ Pipe Cactus National Monument in 2008 and coursed through the Lukeville, Ariz., port of entry. 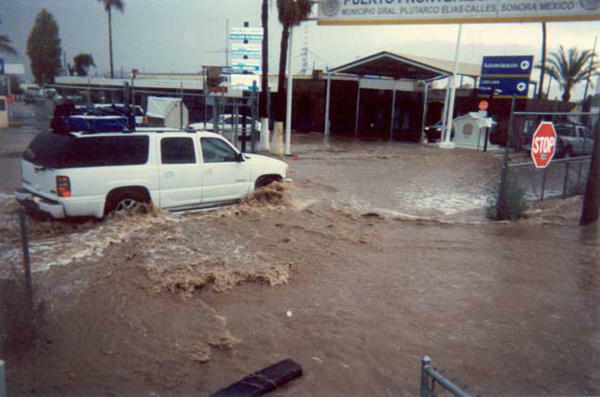 In the twin cities of Nogales in the U.S. and Mexico, raging floodwaters killed two people, washed cars away, collapsed a section of the fence, and caused millions in damages in separate events in 2008 and 2014. "It just walled up the water," Mumme said, "dammed up the water." Even worse flooding is expected if the wall is built in the floodplain of the Rio Grande Valley of Texas. Homeland Security has long wanted to put a fence along the river in Starr County, Texas — a favorite crossing spot for smugglers of drugs and people. "I know from my experience that was a place where we thought a barrier made sense," Border Patrol Chief Ron Vitiello said recently in a speech in San Antonio. He was station chief of the Border Patrol in Rio Grande City when the first fence project was considered. Two things blocked completion of the border fence in Starr County: Congressional funding ran out, and the Mexican side of the Boundary and Water Commission resisted a fence in the floodplain. Today, Starr County is one of the first places on the 2,000-mile border where Trump's wall is expected to resume. Everything is ready to go: The government has been seizing land along the river by eminent domain, and there are already blueprints for where to build about 10 miles of fence. Vitiello insists the U.S. will not strong-arm its Mexican neighbors. "If we go forward inside of the floodplain, then it will comply with our responsibility under the treaty," he said. Locals are not comforted by the government's assurances. Rio Grande City — the county seat of Starr County — is one of three planned sites for the border wall. Two city officials said the earlier planned fence would have been located within 100 yards of the sluggish Rio Grande. They're afraid a wall would prevent the city from properly draining during a hurricane blowing in from the Gulf of Mexico, less than a hundred miles away. "The drainage system would obviously be impacted due to the dragging of debris from water coming back to the riverbanks," Planning Director Gilbert Millan said. City Manager Alberto Perez added: "Or it might end up knocking down the wall because the water's gotta get out of here somehow. And there's nowhere for that water to go when we have those floods." At one point, the U.S. section of the Boundary and Water Commission sided with worried city officials. 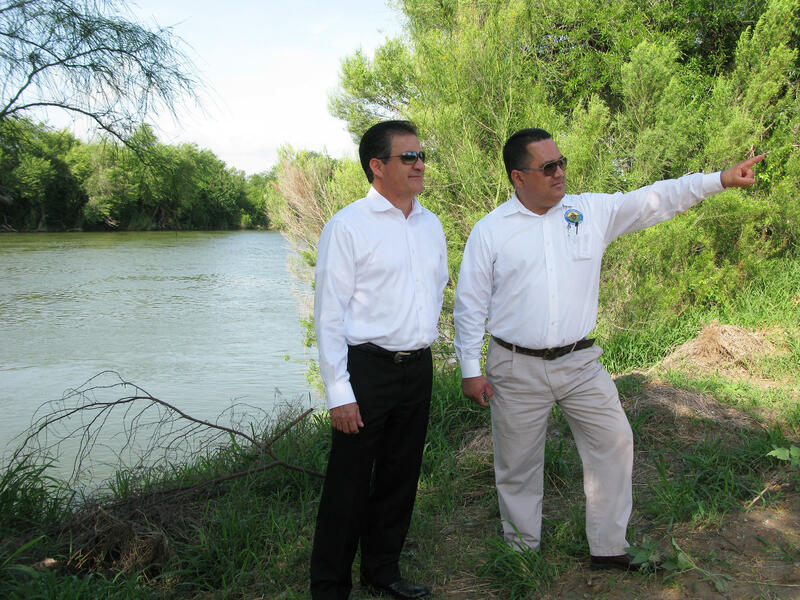 Back in 2007, when the Starr County border fence was first proposed, U.S. river engineers joined their Mexican counterparts in vigorously opposing it. Then the U.S. officials flipped 180 degrees. "And in early 2012, the U.S. section of IBWC said we respectfully disagree with our Mexican counterparts and we approve these walls going up," says Scott Nicol, co-chairman of the Rio Grande Valley Sierra Club. Nicol obtained, through open records requests, thousands of federal documents that he shared with NPR. What they show is that the U.S. section of the commission changed its position after being presented with a new plan for the Starr County barrier commissioned by Homeland Security. In an email to NPR, U.S. Commissioner Edward Drusina wrote: "After careful consideration of the state-of-the-art hydraulic model ... I concluded there was no significant reason to object to Homeland Security proceeding with the construction of the fence." Others, including Mexico's chief river engineer Rascón, still aren't convinced. "We've seen lots of pressure by Homeland Security so that this project moves forward," Rascón said. "But the kind of wall they're planning would have drastic effects on trans-border water flows." President Trump has kept up the pressure to build a wall along the U.S.-Mexico border, though the administration now seems willing to wait until later this year so they can figure out where the funding for that wall is going to come from. But there may be another obstacle here. Mexican engineers think construction of a massive barrier may violate a 47-year-old treaty on the shared waters of the Rio Grande. If Mexico protests, the fate of the wall could end up in an international court. NPR's John Burnett has this report. 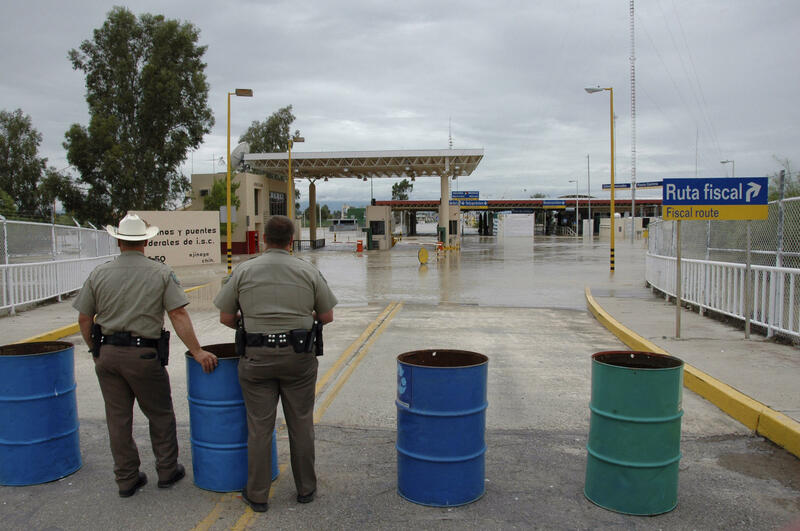 JOHN BURNETT, BYLINE: Mexico is watching with growing alarm as the U.S. Department of Homeland Security moves ahead with its plan to dramatically extend a border barrier that's already caused serious flooding. The 1970 Boundary Treaty lays out the precise border between the U.S. and Mexico and sets rules for the Riverside territories. The treaty states both U.S. and Mexican officials on the International Boundary and Water Commission must agree if one side wants to build any structure that would affect the flow of the Rio Grande or its floodwaters. 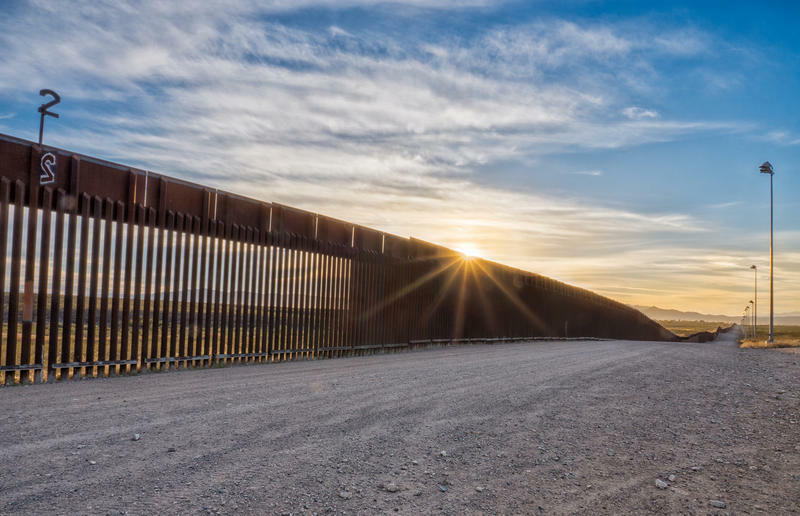 The U.S. has already built nearly 700 miles of security fence, and Mexico has consistently opposed it, says Antonio Rascon, chief engineer of the Mexican side of the commission. ANTONIO RASCON: (Through interpreter) For us, were not in agreement with construction of a wall in the floodplain that affects the transborder flow of water. In general, we have been complaining about the fence since 1992. We're talking 25 years. That's when they installed the first fence in San Diego, and it's been advancing and advancing. BURNETT: In its 128 years of existence, the Boundary and Water Commission or IBWC has tried to resolve differences quietly with professionalism and diplomacy, but the bold plan for Trump's wall is straining that crossborder collegiality. 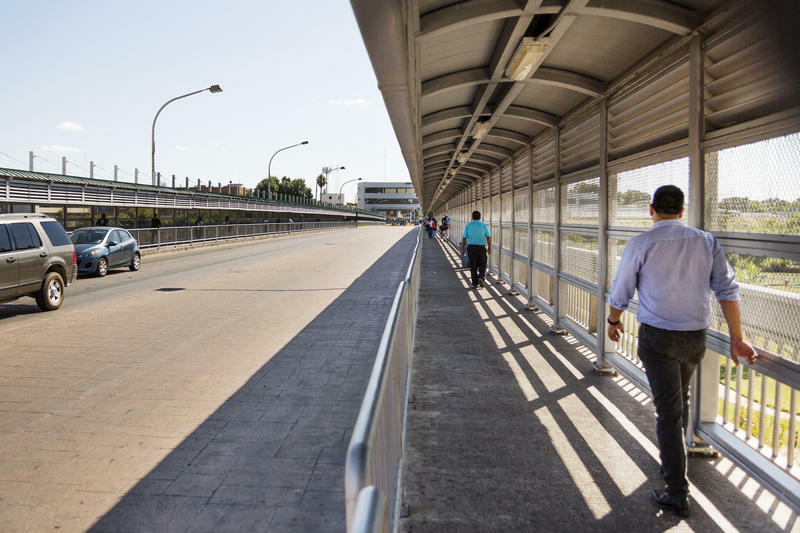 With the earlier fence construction Mexico protested, the U.S. made some design modifications and the project moved ahead over Mexico's objections. Homeland Security has not yet revealed what the new wall would look like or exactly where it would go, but some of the initial schematics - as high as 30 feet made of solid concrete - have prompted Mexico's side of the international commission to speak out for the first time to NPR. Rascon says Mexico will not stand for a treaty violation. RASCON: (Through interpreter) A concrete wall that blocks transborder water movement is a total obstruction. If they plan that type of project, we will oppose it. BURNETT: People familiar with river hydraulics say there's another way to understand a wall built in a floodplain. It acts like a dam. During torrential rains, these obstructions deflect water and worsen flooding. Stephen Mumme is a political science professor at Colorado State University who has studied U.S.-Mexico water diplomacy for nearly 40 years. He says concerns over floods on the border are well-founded. STEPHEN MUMME: We have a history. We know they occur. BURNETT: Over the past nine years, steel fencing along the Arizona-Mexico border has clogged with debris during the summer monsoon season. Floodwaters damaged Organ Pipe Cactus National Monument and coursed through the Lukeville, Ariz., port of entry. In the twin cities of Nogales in separate events, raging floodwaters killed two people, washed cars away, collapsed a section of the fence and caused millions in damages. MUMME: It just walled up the water. It dammed up the water. BURNETT: Even worse flooding is expected if the wall is built in the floodplain of the Rio Grande Valley of Texas. Homeland Security has long wanted to put a fence along the river in Starr County, Texas, a favorite crossing spot for smugglers of drugs and people, says Border Patrol Chief Ron Vitiello. RON VITIELLO: That was a place where we thought a barrier made sense. BURNETT: Two things blocked the project in Starr County. Congressional funding ran out and the Mexican side of the Boundary Commission resisted a fence in the floodplain. Today Starr County is one of the first places on the 2,000-mile border where Trump's wall is expected to resume. Everything is ready to go. The government has been seizing land along the river by eminent domain, and there are already blueprints where to build about 10 miles of fence. But Vitiello insists the U.S. will not bigfoot its Mexican neighbors. VITIELLO: So if we go forward inside of the floodplain, then it will comply with our responsibility under the treaty. BURNETT: Locals in this Starr County seat of Rio Grande City are not comforted by the government's assurances. What they're afraid of is a wall that would prevent the city from properly draining during, say, a hurricane blowing in from the Gulf of Mexico less than a hundred miles away. Gilbert Millan is the city's planning director. Alberto Perez is the city manager. GILBERT MILLAN: The drainage system would obviously be impacted due to the dragging of debris from the water coming back to the riverbanks. ALBERTO PEREZ: Or it might, you know, end up knocking down the wall because the water's got to get out of here somehow. And there's nowhere for that water to go when we have those floods. BURNETT: At one point, the U.S. section of the Boundary and Water Commission sided with worried city officials and joined the Mexican section in opposing the Starr County wall. Then U.S. officials flipped 180 degrees. SCOTT NICOL: And in early 2012, the U.S. section of IBWC said we respectfully disagree with our Mexican counterparts, and we approve these walls going up. BURNETT: That's Scott Nicol, co-chair of the Rio Grande Valley Sierra Club. Nicol obtained through open records request thousands of federal documents that he shared with NPR. 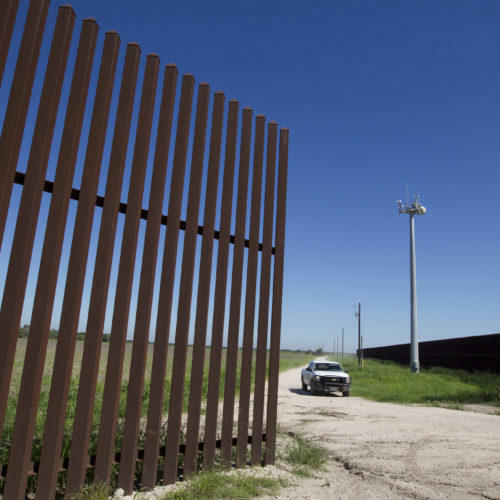 What they show is that U.S. officials changed their minds after being presented with a new plan for the Starr County border barrier that was commissioned by Homeland Security. In an email to NPR, U.S. commissioner Edward Drusina writes (reading) after careful consideration of the state-of-the-art hydraulic model, I concluded there was no significant reason to object to Homeland Security proceeding with the construction of the fence. Others including Mexico's chief river engineer Antonio Rascon still are not convinced. RASCON: (Through interpreter) We've seen lots of pressure by Homeland Security so that this project moves forward. By the kind of wall they're planning would have drastic effects on transborder water flows. MUMME: I think that showdown is coming. This is supposed to go forward on a bi-national co-operative basis, and that's not happening. BURNETT: Again, water diplomacy expert Stephen Mumme. MUMME: Mexico is asserting a treaty right under the 1970 Boundary Treaty is more likely than ever because of the heightened nationalism and the indignation about the United States fence and wall project. BURNETT: To protest the border wall, Mexican officials on the Boundary and Water Commission in Juarez, Mexico, would first lodge a formal complaint with their counterpart across the river in El Paso. If they don't resolve it, the dispute goes to the State Department and its Mexican equivalent and finally to arbitration before a world court. Whether it gets that far may depend on how badly the United States wants to build Trump's wall in Starr County. John Burnett, NPR News, Rio Grande City, Texas. Transcript provided by NPR, Copyright NPR. Immigration is at the forefront of political discourse in Texas according to the Texas Lyceum Poll, an independent opinion poll that is conducted each year to gather the opinions of Texans on major policy issues facing the state. There have been a lot of non-Texans talking about the southern border lately. Presidential hopefuls, public officials and others seem to all have opinions on what's wrong with border security and how to fix it. Take, for instance, talk-show host Sean Hannity. "[We need] virtual fences, virtual surveillance – impenetrable border," he says. Homeland Security Secretary John Kelly said just yesterday that it is "unlikely" that a wall along the United States' southern border will be built in full. That’s different from the Trump administration's original proposed plans to build a continuous 30-foot wall, regardless of the terrain and other potential obstacles. 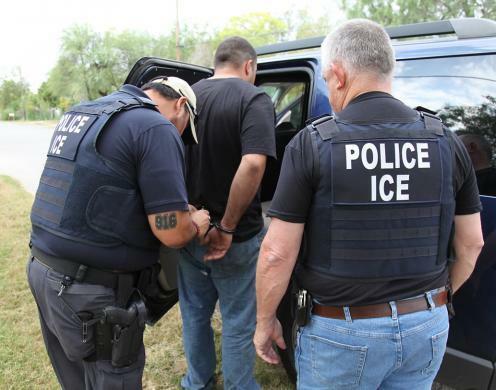 The U.S. Immigration and Customs Enforcement agency arrested 153 undocumented immigrants in the South and Central Texas regions during its most recent round of immigration enforcement. By the time bidding closed Tuesday, there was no lack of companies competing to build the wall President Trump has proposed for the border between the U.S. and Mexico. In fact, by The Associated Press' count, upwards of 200 organizations had expressed interest in designing and building it for Customs and Border Protection.